I had this old copy of The Maltese Falcon for so long that I stopped seeing it. I’d scan my bookshelves looking for something to read. The Maltese Falcon would be stuck in the middle of all my other Hammett: The Thin Man, The Red Harvest, The Glass Key, and Nightmare Town. I’ve read all of these. I love them all. Strangely, I bought them all years after The Maltese Falcon. I don’t know why I waited so long to finally pick up Hammett’s most famous novel. I just did. This weekend, I was looking for something fun to read. I’d just finished The Bone Clocks by David Mitchell. It’s excellent. Mitchell deserves all the praise he’s been getting. But it’s also a heavy novel. I mean this literally in the sense that it’s over six hundred pages of small type, and figuratively in the sense that it makes me think a little harder than I want to about the economic and ecological ruin that we seem to be hurtling toward. I wanted something light. Both literally and figuratively. Those faded green letters on the spine of The Maltese Falcon caught my glance this time. The novel took over my weekend. There’s not much I can say about the book or Hammett that hasn’t already been said. Every crime novelist from Raymond Chandler to Janet Evanovich owes at least part of their naked prose to Hammett. Every crime film director from Howard Hawks to Quentin Tarantino should kick royalties to the Hammett estate. He touched them all, whether they know it or not. Maybe no one owes Hammett more than the Coen Brothers. Their second-best movie, Miller’s Crossing, takes it’s protagonist from The Glass Key, it takes the bloodbath from The Red Harvest, it takes the dame from The Maltese Falcon, it probably takes the character of the Eddie the Dane from The Dain Curse (though I’m not sure; that’s a Hammett novel I haven’t read yet), and it steals lines directly from several of Hammett’s novels. I don’t fault the Coen Brothers for this. It’s what makes the movie great. All of this I knew and expected when I picked up The Maltese Falcon. What surprised me wasn’t the writing itself. It was the artifact of the book. The first thing I noticed when I opened it was a ticket. It was for a basketball game I went to at the Olympics in Atlanta in 1996. I don’t remember purchasing this book, so I did some detective work of my own. The book was priced at two bucks. It was printed in the early eighties, so I picked it up second hand. It didn’t have any markings from A Capella Books, which is the only bookstore I remember going to in Atlanta in 1996. But I must’ve bought the book in Atlanta. Otherwise, it wouldn’t have the ticket in it. I didn’t really live in Atlanta in ’96 so much as I stayed there for a couple of months. I bummed off my friends Laura and Carla. They let me sleep on their couch. We all worked together at a restaurant downtown. I lived out of duffel bag that summer. This meant that my possessions were minimal. I wouldn’t have carried books to Atlanta with me. The only ones I would’ve had would be ones I bought there. And because I was trying to take up as little space as possible, I wouldn’t have bought many. But, for some reason, I bought this one right at the end of my stay there, and I didn’t read it. I understand why I didn’t read it then. Those days during the Olympics were crazy. There was a bomb that went off in Olympic Village. I’d walked across that spot a couple of hours before it blew. There was a bomb scare where I worked in Underground Atlanta. There was a lot of working in a packed house and a lot of drinking after work. There were some pretty great sporting events. It makes sense that an old crime novel would have to wait. What’s harder to understand, though, is why I would’ve bought it. I bought hardly anything during those two months that I didn’t immediately consume. No records. No other books that I remember. No new clothes or sunglasses or Olympics memorabilia or electronics or anything. Just food and drink and the occasional gift for Laura or Carla, who were allowing me to stay rent-free. The survival of this book is also a bit bizarre to me. For most of my twenties, I lived light. When I moved from apartment to apartment, I could typically do it in one trip. If it didn’t fit in the back of my truck, I gave it away or threw it away. When I moved to Los Angeles in 2001, I whittled my possessions down to a truck load again. I left enough room in the back of that truck for me to sleep on the way out. Yet, somehow, an unread copy of The Maltese Falcon was in one of those boxes. Also, I scan my bookshelves at least once a year and get rid of about twenty percent of the books. If I picked up this copy eighteen years ago, it stands to reason that it survived at least eighteen bookshelf purges. And, during that whole time, I did not read it. I don’t think I can say that about any other book I own. This weekend, he was here for me. It was perfect. With the holiday season coming up and all this cultural pressure for gifts, I’m feeling right now like no one has to get me anything. An eighteen-years-younger version of myself already spent a couple of bucks and hooked me up. 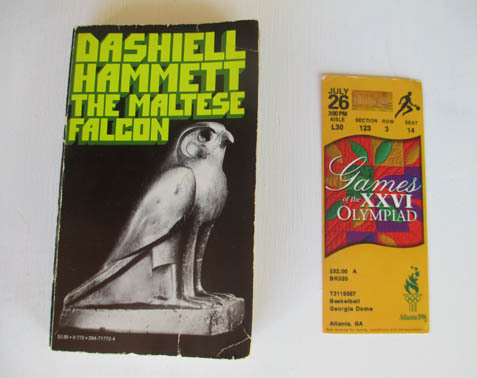 This entry was posted in Other People's Books and tagged Atlanta Olympics, Coen Brothers, Dashiell Hammett, David Mitchell, Raymond Chandler, The Maltese Falcon. Bookmark the permalink.